The highlight of your stay at Moon Shadow might just be waking up to a stunning 180-degree view on the highest quality bed linen which dresses a plush four-poster king-size bed of your dreams. Tall windows and high-vaulted ceilings allow natural light to immerse the room, creating a sense of harmony between the panoramic natural beauty of the island and the spaciousness of your bedroom. 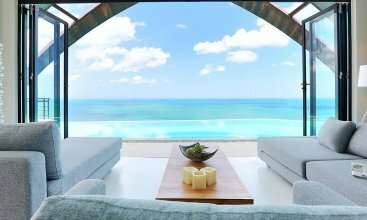 Step out onto the huge private terrace and feel on top of the world as the fresh sea breeze dances across your skin. 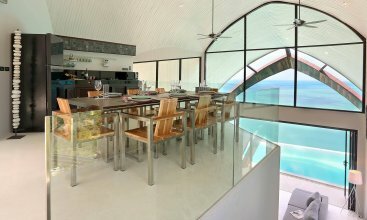 Beyond the jaw-dropping views, a flat-screen and Apple TV are perched perfectly for a virtual escape, while an iMac takes care of any out-of-office computer needs, and an iPod docking station helps set the mood to your desire. 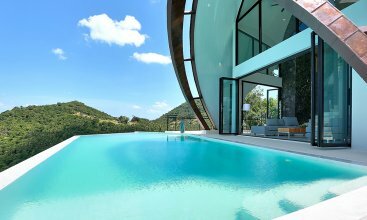 Contemporary Thai artwork adds a cultural element while complementing the contemporary design that flows throughout the entirety of the villa. An indulgent walk-in closet alongside a spectacular white stone en-suite with refreshing rain shower, freestanding bathtub and high-end amenities add a palatial element to this spectacular space. 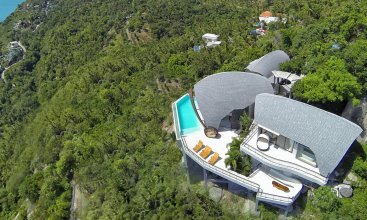 Wake up to 180 degree views of the ocean and start your day with all that Samui has to offer. 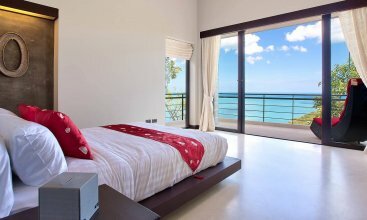 Sleek and modern in design, the master bedroom is a spacious haven with floor to ceiling glass sliding doors offering natural light and a feeling of spaciousness as you step out to your own private terrace and feel the sea breeze dance across your skin. With a large modern 4 poster king size bed, walk-in wardrobes, flat screen TV, Apple TV, i-pod docking station, LAN access and beautiful Thai artwork touches reminding you of the heritage and culture of amazing Thailand – the master bedroom also boasts a spectacular white stone en-suite complete with rain shower head and free-standing bathtub for pure relaxation.